Ben Brantley of The New York Times calls it “Spectacular! 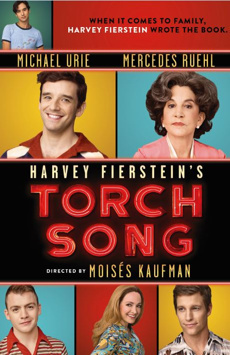 A Grade-A energizing joy!” And Entertainment Weekly raves, “Torch Song brings laughter and tears simultaneously. It’s impossible not to feel electricity in the theater.” Don’t miss this “profoundly moving” (The Hollywood Reporter) production of the Tony Award-winning play, starring Drama Desk Award winner Michael Urie (Younger, Ugly Betty, Buyer & Cellar) and Academy Award and Tony winner Mercedes Ruehl (The Fisher King, Lost in Yonkers), directed by Tony nominee Moisés Kaufman (The Laramie Project, I Am My Own Wife).